Northrop Grumman Corporation announced that its Cygnus spacecraft, following a highly successful stay at the International Space Station, has departed from the station to begin the next phase of its mission. While docked with the station, Cygnus performed a reboost experiment for the International Space Station demonstrating the spacecraft’s capability to raise the orbiting laboratory’s orbit. The “S.S. J.R. Thompson” is now set to deploy six CubeSats in orbit before reentry into the Earth’s atmosphere. This mission marks the fifth time that Cygnus has been used for NanoRacks CubeSat deployments during its secondary payload mission phase. Cygnus departed from the International Space Station at 8:37 a.m. ET. Five days before departure, the space station reoriented itself and Cygnus fired its thrusters for the International Space Station reboost demonstration, making Cygnus the first American spacecraft to reboost the station since the retirement of the Space Shuttle fleet seven years ago. 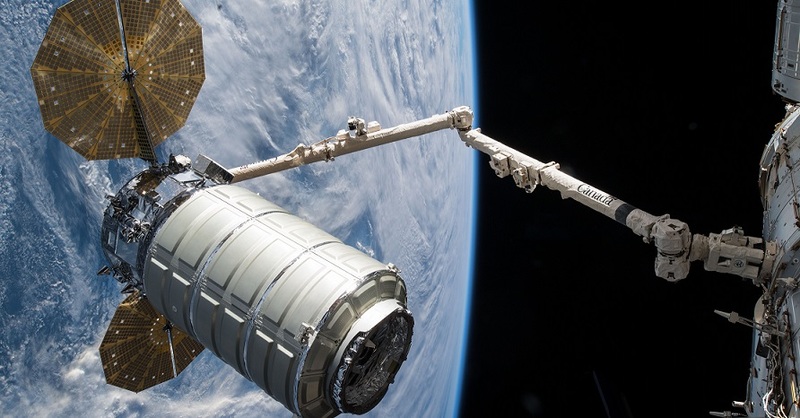 The spacecraft spent 52 days at the station before leaving with more than 6,600 pounds (over 3,000 kilograms) of disposable cargo, a new record for Cygnus. The mission began May 21 when Cygnus launched aboard a Northrop Grumman Antares™ rocket from NASA’s Wallops Flight Facility in Virginia. Upon arrival at the orbiting laboratory, Cygnus delivered approximately 7,400 pounds (3,350 kilograms) of cargo and science experiments to the astronauts, marking the company’s ninth operational mission to the International Space Station. Following unberthing, the “S.S. J.R. Thompson” will raise its orbit above the International Space Station and use a NanoRacks CubeSat deployer to release six CubeSats into orbit. Four of the CubeSats will join Spire Global’s commercial weather satellite constellation for global ship and weather tracking. The NanoRacks manifest also includes the AeroCube 12A and 12B satellites. These two CubeSats come from the Aerospace Corporation and test new star tracker imagers and high-efficiency solar panels. The mission is expected to end July 30 when Cygnus will execute a safe, destructive reentry into the Earth’s atmosphere over the Pacific Ocean.